What Happens a Contract When a Business Changes? Can a Contract Survive a Name Change or Other Change? What if you have a contract with another business or with a person, and there is a significant change in one of the businesses. Some business changes are small, like a location change, and some are large, like a bankruptcy or the company goes out of business. For example, maybe a business changes its name or is purchased by another business or goes bankrupt. You might work for a business as an independent contractor and you have a contract with XYZ business. Or your company might have a license agreement with a company, to sell licensed products. Or a business may be leasing commercial space from you. The simple answer of what changes is "it depends," and a lot is based on what the original contract stated. Many business contracts include sections dealing with what happens if there is a change in the business. Two contract principles that might affect the need to make a change in the contract are novation and assignment. Novation is a substitution. Duhaime's Law Dictionary says that novation is the substitution of one party or obligation for another. A novation agreement may be part of an original contract, or it may need to be signed at the time of the change. In the case of a name change, a novation agreement might be needed in order to make a new contract with the newly named business. Assignment is a transfer of some right or duty to someone else. For example, some employment contracts state that the duties of the employee can't be transferred to someone else. A contract might include the right to transfer the responsibilities of one of the parties of a contract to another business entity, which might include the assignment to a successor (new) company. 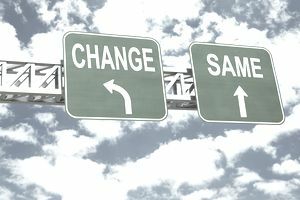 Another option for changing a contract for a business change is to create a letter of agreement that refers to the specific change and have both parties sign it. What Happens to an Employment Contract if a Company Changes its Name? "I have an employment contract with a business. Things are not going well, and I was informed this morning that the company has changed its name and legal entity. They even have a new sign on the building. Does this mean the contract is void? More to the point, does that mean I don't have to abide by the non-compete agreement?" In these types of situations, a lot depends on the wording of the contract. Some contracts plan for the possibility of changes. Some contracts specifically state that the parties "now known as XYZ Corporation" or "by any other name" or " by which the party may be titled." or something to that effect. Even if the possibility of a name change isn't specifically mentioned in the contract language, the business doesn't get out of contracts just by changing its name and legal type. If you think about it, that would be a neat way to avoid debts, by just changing the name of the business. So, no, a name/entity type change doesn't mean a contract is void. What Happens to a Contract When a Business is Bought or Sold? If a business has a major change in ownership, (the sale of a business, for example), part of the terms of the sale may be the assignment of the contract to the new owner. If the business sale documents don't specify, you might have to look at the contract itself. As part of the buy/sell process, a new contract may be substituted for a previous contract, with the agreement of both parties. This is the novation section discussed above. What Happens to a Contract When a Business Declares Bankruptcy? The bankruptcy judge in a bankruptcy process decides what happens to active ongoing contracts during the bankruptcy process. You can hire an attorney to protect your interest in the process, including making the debtor (the company in bankruptcy) specifically affirm or reject your contract. The amounts owed to you under a contract also fall into the bankruptcy process and you become a creditor. Depending on the type of bankruptcy - Liquidation (Chapter 7) or Reorganization (Chapter 11) - you may be included in the list of creditors to be paid during the process. You should know that if you and the debtor have an ongoing contract that obligates you both to certain requirements (buying and payment, for example), you can't stop doing what the contract requires without risking being in default. Disclaimer: If you have a contract with a business and something changes, consult your attorney before making any decisions, signing a new contract, or making statements that might compromise your status in the contract.